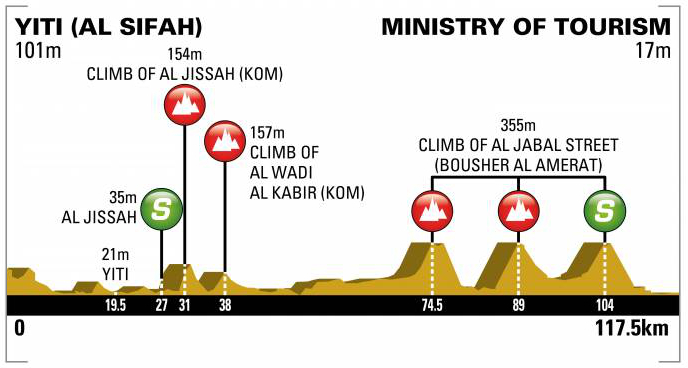 Stage 4’s 117.5km race from Yiti (Al Sifah) to the Ministry of Tourism is likely to be an explosive affair, with a shorter total distance and several punchy climbs which will force the favourites to attack hard in order to break the race apart. Yesterday’s stage provided some further insight as to who is best to watch out for on this testing course and it could be those same faces which end up deciding today’s outcome again. Greg Van Avermaet is using this race as some final preparation ahead of the start of his classics campaign and he is already looking to be on track for some serious form once again this year. His showing yesterday was impressive, distancing a strong group of rivals in the final kilometre with ease and never really looking up against it when fighting for the stage honours. An expected frontrunner again today, it would be of little surprise to see him form part of an elite breakaway and see the stage out with another strong sprint finish. 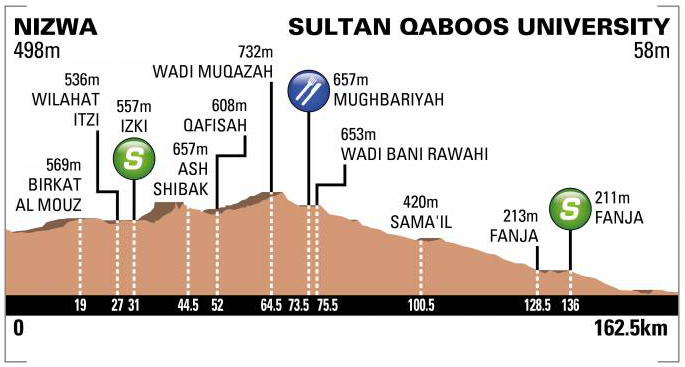 On such a short stage, he will need to make the race as hard as possible for his rivals, as there are several stronger sprinters who have the potential to survive with him to the final kilometres. Fabio Felline suits this stage profile extremely well, and if he continues his rise to the sort of form which made him such a threat in the past, there is a good chance he can finish the day with a win here. He stayed in contention throughout Stage 2, already proving he can match the likes of Greg Van Avermaet for example, which shall give him the confidence to follow the key moves again here. One of the fastest riders most likely to feature at the end of the day, if he can make the cut, then it could be an easy surge to the line for him. Alexander Kristoff performed impressively yesterday and is another rider who certainly looks to be building his form convincingly ahead of the spring classics which begin next month. On such a short stage, the likelihood of him making the moves increases, though the flip side of this is that many other are also more likely to survive; specifically those faster in a sprint finish. Regardless, if he can make his rivals suffer, then we might get an early glimpse of what the next couple of months hold with a Alexander Kristoff versus Greg Van Avermaet sprint for the line. 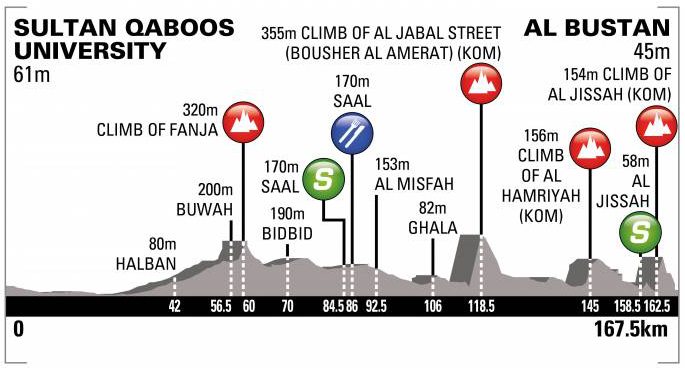 Nathan Haas will believe he can win this stage in a similar fashion to Stage 2 earlier in the week, looking to pounce from an elite group of riders and get the jump on the likes of Greg Van Avermaet and a potential Alexander Kristoff. He needs the race to ditch the fastest riders in the bunch, but not at such an intensity that he suffers enough to give the classics focused riders the upper hand. Regardless, he is an intelligent rider and will know how to pace himself alongside the big names today, potentially doubling up on his current tally of wins this season already. Others to consider are Alexey Lutsenko, Rui Costa, Magnus Cort and Giovanni Visconti. As highlighted in yesterday’s preview, Nathan Haas was earmarked as a rider most likely to benefit from a tough finale and heavily reduced numbers heading into the finish, thus it was of little surprise to see him take a much deserved win in the end. 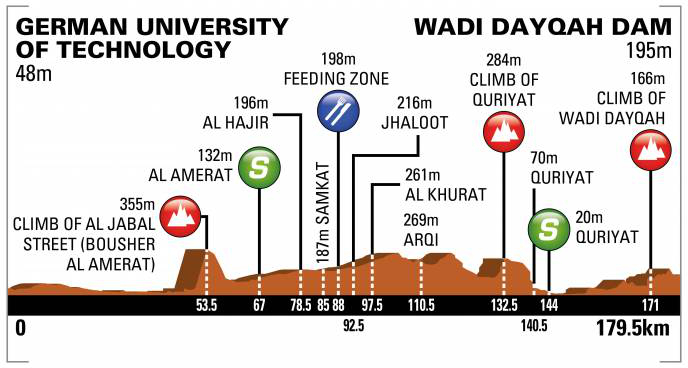 Stage 3 is a 179.5km route from the German University of Technology to Wadi Dayqah Dam, featuring plenty of rolling terrain, with the majority of the focus upon the final few kilometres which culminate in an uphill dash to the line. Greg Van Avermaet was a key protagonist during Stage 2 and there is no doubt that many would have backed the BMC rider to take the win from the reduced lead group, but the Belgian was well beaten by Haas unexpectedly. Regardless, today is another well suited opportunity to pursue victory and Avermaet is bound to find himself the favourite yet again. If he can stay in the lead group and get a clear run to the line, then it shall be a huge ask to deny the Belgian classics specialist for a second consecutive day. Nathan Haas is now an interesting prospect in the contest for the overall victory and may emerge as a tough rider to relinquish his ownership of the leader’s jersey. If he so wishes, he can now look to ride defensively and even lean upon his rivals to chase down those who are considered a threat to everyone hoping to win 2018’s Tour of Oman. This is another day which plays to his strengths, and given his current form, he should not be discounted from doubling up here on Stage 3. Søren Kragh Andersen was unfortunate enough to be snarled up by two separate accidents yesterday, the last of which was only 15km from the finish, meaning he waved goodbye to any chance of contesting the sprint. He does not seem to have been affected by these crashes though and shall be extremely motivated to seek redemption of sorts by working hard for the win here. If he does manage to make the cut, he could be the fastest man present and would surely lead the charge to the line home with ease. Fabio Felline performed well yesterday, showcasing the talent we had seen little of during a disastrous 2017 season previously. The Italian rider is pleased with his return to action thus far, now sensing some semblance of form and eager to find himself atop the podium again soon. He is a tactically astute rider who often reads the race better than most from a breakaway or small bunch, meaning one well timed attack on the final slopes could be enough for Felline to take the win. Others to consider are Magnus Cort, Alexander Kristoff, Alexey Lutsenko, Dries Devenyns and Giovanni Visconti.